I you’re used to just opening a jar of BBQ sauce and slathering it on chicken pieces, then I urge you to try this. It’s only a little bit more effort, but sooooooo much tastier. Jenny Keller Ford put me on to this recipe which comes from The Pioneer Woman. This version I’ve made is a very slight variation on the original. – 1 garlic clove, crushed or minced. 1. Brush a little olive oil over a baking tray, and place the chicken thighs on top, skin side down. 2. Bake in a 200C/400F oven for 25 minutes. 3. While the chicken is cooking, put the rest of the ingredients in a pan and heat for about 5 minutes until the jam is dissolved, and it is all hot and bubbling gently. 4. Take the tray of chicken out of the oven, if a lot of fat and water has come out of the chicken, you may want to drain the majority of it off, just leave a little in the bottom so that it doesn’t stick. Brush the chicken thighs with the sauce. Turn them over so that the skin side is now on top, and brush the tops with more sauce. 5. Place back in the oven for 7 minutes. Remove, brush more sauce on top, cook for another 7 minutes. Remove, brush more sauce on top, cook for another 7 minutes. So that’s 3 lots of 7 minutes on top of the original 25 minutes. You can be generous with the sauce brushing on each occasion, there’s plenty of sauce there. Add a baked potato, corn on the cob, a salad, and you’ve got yourself a feast! yum. I bet the apricot preserves are great. The peach that I used was fantastic and not much different from the apricots. Very good and easy recipe and I’m sure one could use chicken breasts instead. Just adjust the time and you may need to use a bit more oil to coat the pan as the white meat doesn’t put off as much fat and juices as the dark. I’m glad you enjoyed. what have I told you about meat and fruit? … no, no, no! Once the jam’s all dissolved and mixed in you’d never know! Yes, do! I must admit to being no more adventurous than the sauce straight out of the jar in the past, but no more! Last night was family dinner at my house (every Thursday). I haven’t had a roast in ages and had a craving but my daughter doesn’t eat red meat. I don’t make it a practice to make two dinners but I did last night. I had purchased the chicken earlier and saw your recipe. Yay. She loved the chicken and the rest of us gorged on crock pot roast beef. One of the menu items that surprised me most in England was the BBQ! I never knew it had crossed the Atlantic. I’ll swear, though, that pulled pork sandwiches were on every menu. 🙂 This looks like an easy and yummy recipe for the chicken! Yep, we like our BBQ and our pulled pork! 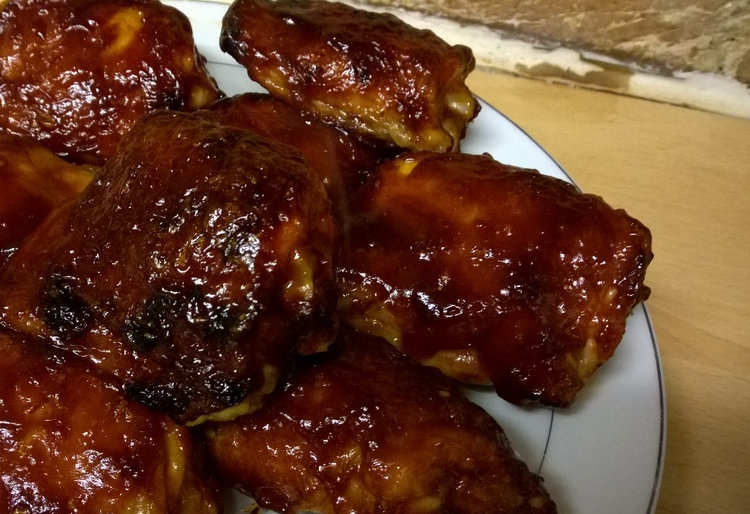 I did this same recipe with chicken wings a couple of nights ago, with a little shorter cooking time and it was yummy too! Surprising how much nicer it is that just the bottled barbeque sauce on its own. Fruit and meat?,, what? Did you see any fruit on your haggis?, maybe a slice of pineapple, a dab of apple sauce? No. Case closed! Get away from the haggis? … is that even possible?